The God of Christianity isn’t the violent God of archaic religion, but the non-violent God who willingly becomes a victim in order to free us from our violence. 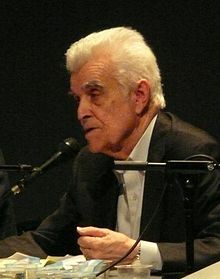 René Girard (December 25, 1923 – November 4, 2015) was a French historian, literary critic, and philosopher of social science. His work belongs to the tradition of anthropological philosophy. There is always an attempt to move away from the Cross, that is, to perpetuate man’s misrecognition of his violence and protect his pride from the revelation. Without the Cross, there is no revelation of the fundamental injustice of the scapegoat mechanism, which is the founder of human culture, with all its repercussions in our relationships with each other. Des choses cachées depuis la fondation du monde (1978), as translated by Stephen Bann and Michael Metteer (Continuum:1987). It was Plato who determined once and for all the cultural meaning of imitation, but this meaning is truncated, torn from the essential dimension of acquisitive behavior, which is also the dimension of conflict. If the behavior of certain higher animals, particularly the apes, seems to foreshadow human behavior, it does so almost exclusively, perhaps, because the role of acquisitive mimesis is so important in their behavior, although it is not as central as it is for the human being. If one ape observes another reach for an object, it is immediately tempted to imitate the gesture. It also happens that the animal visibly resists the temptation, and if the imitative gesture amuses us by reminding us of human beings, the failure to complete it, that is to say the repression of what already can be nearly defined as a desire, amuses us even more. It makes the animal a sort of brother to us by showing it subject to the same fundamental rule as humanity—that of preventing conflict, which the convergence of two or several avid hands toward one and the same object cannot help but provoke. An examination of our terms, such as competition, rivalry, emulation, etc., reveals that the traditional perspective remains inscribed in the language. Competitors are fundamentally those who run or walk together, rivals who dwell on opposite banks of the same river, etc…The modern view of competition and conflict is the unusual and exceptional view, and our incomprehension is perhaps more problematic than the phenomenon of primitive prohibition. Primitive societies have never shared our conception of violence. For us, violence has a conceptual autonomy, a specificity that is utterly unknown to primitive societies. We tend to focus on the individual act, whereas primitive societies attach only limited importance to it and have essentially pragmatic reasons for refusing to isolate such an act from its context. This context is one of violence. What permits us to conceive abstractly of an act of violence and view it as an isolated crime is the power of a judicial institution that transcends all antagonists. If the transcendence of the judicial institution is no longer there, if the institution loses its efficacy or becomes incapable of commanding respect, the imitative and repetitious character of violence becomes manifest once more; the imitative character of violence is in fact most manifest in explicit violence, where it acquires a formal perfection it had not previously possessed. At the level of the blood feud, in fact, there is always only one act, murder, which is performed in the same way for the same reasons in vengeful imitation of the preceding murder. And this imitation propagates itself by degrees. It becomes a duty for distant relatives who had nothing to do with the original act, if in fact an original act can be identified; it surpasses limits in space and time and leaves destruction everywhere in its wake; it moves from generation to generation. In such cases, in its perfection and paroxysm mimesis becomes a chain reaction of vengeance, in which human beings are constrained to the monotonous repetition of homicide. Vengeance turns them into doubles. There is no culture without a tomb and no tomb without a culture; in the end the tomb is the first and only cultural symbol. The above-ground tomb does not have to be invented. It is the pile of stones in which the victim of the unanimous stoning is buried. It is the first pyramid.